OFFICALLY 4 1/2 years old...if you haven't heard!!! If you have crossed Micah Claire's path in the last week then you have been well informed that she is officially 4 1/2 years old!!! Last Sunday she went straight into Sunday School telling all her friends that she is now 4 1/2 and she hasn't stopped telling everyone she's seen since then! I just can't believe that my first born, my baby girl will be 5 years old in 6 months. I honestly have no idea where the time has gone; it's like a blinked a few times and BAM here we are! NUTS!!! My girl is growing up way too fast! Where did my baby go :( LOVE you Clarie Bear!!! 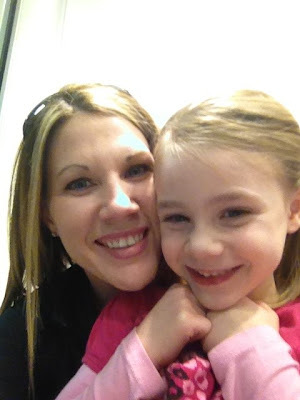 This sweet, innocent smile has had my heart since the moment I heard her cry in the delivery room! These days she is anti-bows and anti-head bands.......kinda hard for this momma to say okay you don't have to wear one! She is so like me; I was the most anti-girl when I was younger, hated bows, dress, skirts and everything else my mom tried to get me to wear! Two weeks ago Mimi came and took MC to get a mani and pedi! She had a BLAST; thanks Mimi! Matching electric blue with little white flowers!!!! She is still 110% into gymnastics. It truly amazes me that she is such a natural at it! You know you live in Arkansas when you have a tractor in the background;lol!!!!! She may not like girly stuff....... But this girl is into ANYTHING that is shiny or glittery. I promise you SHE should would wear this shirt EVERYDAY if I would let her. I have washed this shirt sooo dang much that there are probably 50 sequences missing...but she still LOVES it!!!! 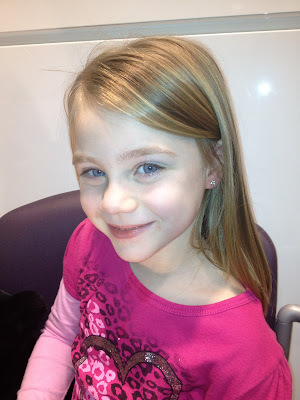 Okay if you read the blog you are well aware that this child has been asking for OVER a year now to get her ears pierced. Me and Daddy have debated over the right time, the right age,etc..... MC has attempted several go's at it but always chickened out when she got into the store. WELL.......................................................... That ALL changed on President's Day!!!!!! We were in Hot Springs having our 1 year check up with DR. Vallery and we decided to go by the mall and do a little shopping.... She kept asking and asking and I finally said sure lets go; TOTALLY expecting it to be like the other 3 non-successful attempts..... Little did I know!!! She got up in the chair, let me fill out the paper work, they cleaned her ears and Shawn said... This Crap better not be happening!!! I looked at him like yeah right we all know what's about to happen... she's gonna cry and get down. Well that point never came!!!! The dotted her ears and I okayed the spots. Once again the hubs said...This better not be happening; your (meaning Momma) gonna be in serious trouble if this happens!!!! The girl said once I open these earrings they are yours and you have to pay even if she backs out. I looked at MC and asked if she really wanted to do this and told her I had to pay from this moment forward. She looked at me and said "momma I'm really ready this time!" I couldn't believe it.... out the earrings came and the girl called the other girl over so they could do both ears at the same time. I thought I was gonna THROW UP!!!! The little girl asked me if I was okay and I asked her if she had a Valium for me. I don't know if I've ever been that nervous, anxious, scared, and upset at the same time. It was Honest to God EXTREMELY overwhelming for me!!!!! They put the guns to her ear... STILL I expected her to say NO and jump up.. but she didn't!!! They counted One, Two, Three and I could have crapped my pants and thrown up at the same time!!! Then BAM it was OVER!!!! She cried for a few seconds and the it was over!!!!!!!!!! She couldn't stop starring at them in the mirror; she has the BIGGEST SMILE on her face!!!! I was so proud of her; she was such a brave little girl!!! Daddy on the other hand..... well... He filmed the entire process and he was SICK!!! He didn't talk to me for several hours... unless it was to say... I can't believe YOU let her do this.... She's to **** young.... this is all your fault! It was humours to me but I also understood his feelings as well. She is young and she is our baby and it's hard to let her grow up some! LAST PICTURE WITH NO EARRINGS!!!!!! And here they are..... she looks beautiful!!!!! I have never been so proud of you Micah Claire Cowart!!!! She got her own bag with all her ear cleaning supplies!!!! Now it's 6 weeks of cleaning them 3 times a day.... uhhhh! She couldn't wait to get to school that next day and show all her teachers and friends!!! Last Thursday Our Kinley bugs turned 17 months old. This is her last official month to just be ONE... next month One and a Half, sob sob!!!! It seems like everyday this girl is changing, growing, and learn more and more. This isn't much she can't say; I swear she says 5 or 6 new words everyday. She is very interested the potty........Let me rephrase that... She is very interested in whatcing US us the potty;lol! Maybe potty trainng will be coming soon!!!! Oh and how I forgot about those fits... OUT OF NO WHERE!!!!! TOTAL MELTDOWNS!!!!! Right after these fits started I got her monthly email from babycenter that said...."Meltdown city" GOOD LORD were they right. Luckily they don't' last long! It's funny when these meltdowns occur my hubs shoots me a glare (a not so nice one) and says.... AND YOU WANT ANOTHER ONE!!!!! LOL! But after they pass, my sweet Kinley bugs is back! OMG she has learned to pull herself up onto EVERYTHING and ANYTHING these days!!!! Her favorite thing to do is get up on the potty and get into the medicine cabinet! Can't believe our sweet baby girl is only a few weeks away from being 1.5!!! !